Nothing seems to evoke controversy more than the who-has-the-best-handles-ever-in-the-NBA question. In a recent CelticsLife article, my vote went to Kyrie Irving, but our readers threw out other candidates such as Steph Curry, Pete Maravich and Earl Monroe. 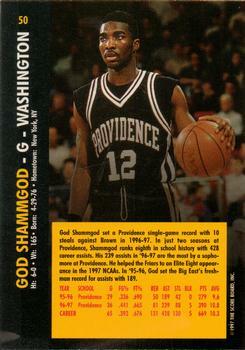 But one name came out of the past that got my attention - and that is God Shammgod. I often cite Irving's rapid, jackhammer-like dribbling, and Shammgod had that too. You can see the similarities to Kyrie's handle in the first video, and compare it to Kyrie-versus-Celtics below. Very similar - right? Our readers were right. We are looking at two of the fastest, and best, handles ever in the NBA. Shammgod serves presently as player development coach for the Dallas Mavericks.